Today is the first operating day for our ski center! The weather is sunny and calm and we waiting for you to enjoy your favorite sport. The lifts that will open are Meterizi with slope No 8 and Baby lift for the beginners. Chair lift, Sarantovrisi 1 will be available just for a route. 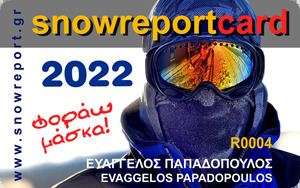 Send "Snow KAI" at 54344 and you will get the operation information for Kaimaktsalan ski center.